Spring Cleaning, Pruning and Feedings in the Garden! 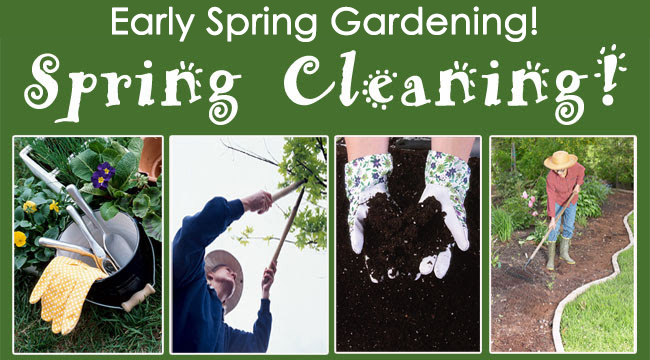 We have all heard of a Good Spring Cleaning inside our homes, but this is also true for Spring in the Garden! In flower beds, spring clean-up involves cutting back winter-killed foliage and flower stems on those perennials, bulbs, shrubs and trees that were not cut back in fall. This should be done in early spring as soon as the ground has thawed and before growth begins. Get out and rake leaves and debris from your garden beds. Remove last year's dead foliage from your hosta, daylilies, iris, and peonies. In fact many perennials fare better during winter if they are pruned or cleaned up in early spring rather then the fall. These include butterfly weeds, coral bells, tickseeds, artemisias, asters, campanulas, cardinal flower and Russian sage. Cut back ornamental grasses and other perennials you left standing in the garden through the winter. PRUNING AND CLEANING TREES AND SHRUBS IN EARLY SPRING. When trees grow too close together, leaves and branches die as they compete for sunlight and airflow. Pruning also helps to maximize flowering and produce bountiful fruit. Pruning on a mild, dry day, helps plants develop into sound structures without over-stressing their limbs. When pruning, first prune out dead and diseased branches. This is often called thinning. Sometimes this is all that is required. Then remove the overgrown and smaller branches to increase light and air at the crown of the tree. Cut branches at the node, the point at which one branch or twig attaches to another. Trees and shrubs that should be pruned in early spring include, narrow-leaved evergreens (conifers). This improves their shape, keeps them in bounds, induces bushy growth, and thins out unwanted branches. These include arborvitae, juniper, pine and yew. Broad-leaved evergreens grown primarily for foliage and also summer-flowering shrubs, vines, etc that should be pruned are butterfly bush, crape myrtle, perennial hibiscus, rose of Sharon and trumpet vine (not old fashioned hydrangea). Prune bush roses (hybrid teas, floribundas, grandifloras, miniatures) to repair winter damage, shape plants to induce flower-bearing shoots. This type of rose blooms on new growth. Climbing roses, which should have only winter-killed parts removed at this time, because in most types blooms develop on shoots arising from old wood. Any cane that has lived through the winter is a potential source of flowers, and therefore precious. If a plant flowers in the spring, it can be pruned immediately after it has finished blooming for the season. Plants that bloom in the early spring set their flower buds in the fall. Winter or early spring pruning of these plants would reduce the amount of spring blooms for them. Think twice, cut once, and watch carefully. Always disinfect your pruning shears before moving from one plant to another to avoid spreading any disease among plants. A quick dip in rubbing alcohol works well as a disinfectant. Also make sure your pruning shears are sharpened, a nice clean cut is always preferred. Staking plants is nobody's favorite garden chore and that could be why so many of us wait until plants are bending and flopping before we take the time to stake our plants. Staking in spring means you will have a few weeks of visible stakes but it will save many headaches throughout the rest of the growing season. After pruning, staking and clean-up, fertilize your shrubs and while night time temps remain cooler spray your fruit trees, roses, and other ornamental trees and shrubs with an All Season Oil Horticultural Oil to smother overwintering insects, eggs, and immature insect Botrytis on peony foliage stages. You may also want to freshen up the the mulch on your flower beds.